Built to last a lifetime. Crafted in the traditional method, each dresser has a full rectangular web with dust jackets between each drawer. Drawers boast solid wood fronts, sides and backs as well as sliding dovetail joints and glide effortlessly on precision drawer slides. The five-drawer Dresser is a traditional vertical chest. Drawers are graduated in heights of seven, eight, nine, and ten inches. The three-drawer Dresser is a shorter version of the five-drawer model. Drawer heights are graduated in the same dimensions as the six-drawer. Optional mirrors frames are available for all three dressers. The tall mirror works well with three-drawer and six-drawer dressers; the smaller mirror works well with the five-drawer dresser. The nightstands are scaled to fit all Pacific Rim beds and feature a finger-jointed drawer and open shelf. 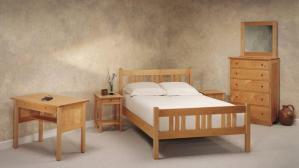 They are constructed with mortise and tenon joints and come completely assembled. Three Drawer Dresser 18″ 33 1/2″ 31″ 7″, 8″, 9″ Full rectangular web with dust jackets between each drawer, drawers have solid wood fronts, sides and backs as well as sliding dovetail joints, drawers glide on precision European drawer slides. Nightstands 17″ 17″ 24″ Finger jointed drawer, open shelf, mortise and tenon joinery, arrive completely assembled. Wardrobe/Video Cabinet can house a television and DVD player or provide attractive storage for clothing or bedding. Writing desk (available with optional Hutch) creates an office space within a den, bedroom, or family room. The Video Cabinet features self-storing pocket doors which swing out and push conveniently into the cabinet. The cabinet section will hold a large television set and DVD player. The lower drawers provide additional storage. The Writing Desk features two finger-jointed drawers, fully-paneled sides, and a bookshelf underneath. This desk becomes even more functional with the optional Hutch is added. The Wardrobe/Video Cabinet and Tower drawers feature sliding dovetail joints and solid-wood fronts, sides, and backs. Each piece comes fully assembled.